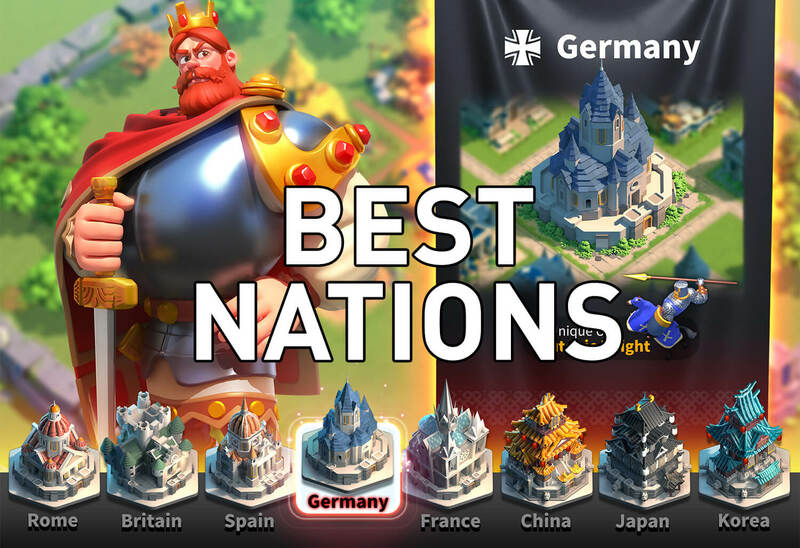 The diversity of civilizations (or nations) in Rise of Kingdoms is the main feature that brings a lot of interesting into the game. You must choose one from a list of 11 civilizations right at the beginning of the game. Each nation has its own building architecture styles, perks, starting commanders and special units. The strengths and weaknesses of them bringi into the game a lot of interesting matchups. Throughout the game, you are also able to switch to any other Civilization with ease to fit your playing style and your state in the game better. 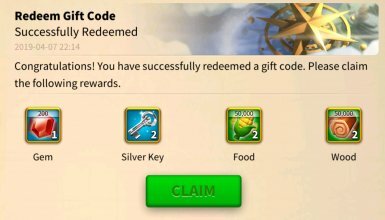 You can do that by using the Civilization Change, which can be bought with 10,000 Gems. What Are The Best Civilizations (Nations) in Rise of Kingdoms? The reason is that Arabia is very unique! Having that damage buff for rallies is really going to be beneficial if you are a rally person (and you always should do rally on Forts to get your Caster leveling up easier). Excellent for your Alliance when targeting the enemy Flags and Fortresses. It’s also gonna increase your damage dealt to Barbarians and other Neutral units, which are really helpful for everyone at the late game. The Cavalry buff is also very beneficial for a lot of players. A lot of people have invested on Nuker Commanders. This is going to be really benefit for you by having that extra skill damage increased by 5%. Again this buff is very quite unique. Troop marching speed increased by 5% is another really great buff as most people want to focus onto Minamoto. If you’re trying to build him as a full cover unit, and he is also a skill commander, you will have that troop marching speed buff and also having this skill damage buff. This is because of the huge hospital healing speed up buff this is going to be beneficial for you when you get into Alliance Battleground. The Troop HP buff is universal. It applies to all troops in the game, which is pretty insane! Also, at the beginning, if you have Joan of Arn as the starting commander, you can farm and grind up a lot easier! With Strengths and Weakness explained! I really want to highlight this Hospital Capacity buff. Korea has the same buff like this one. Increasing the hospital capacity by 15% is going to be beneficial for you, especially in the late game. Because you’re going to have a lot of high tier troops. When you fill up your Hospital capacity, the units that doesn’t get in the hospital will instantly die. You don’t want those high-tier units dead. They are very expensive and cost you a lot of time to train. You don’t want to waste your resources and time again. This is also a good buff for the late game but it can be negated by just grinding and farming using some speed-ups. You can also get some runes for increasing the farming speed so this may be something that is very optional. Personally I’m not really going to weigh this too much. I don’t really find the full benefit for the stone gathering speed buff. This could be really beneficial if you are building full cavalry armies. A lot of the Pay-to-win players really focuses on Cavalry at the beginning of the game so maybe this nation is one the best civilizations or the pay-to-win players. The next civilization we’re going to be talking about is the Ottoman. This buff is really good as well! It is going to be really beneficial because in Rise of Kingdoms, troop marching speed is something that is really crucial. Coming into Alliance battlegrounds, this is going to be really be a benefit. If you are building into full archer units, it is definitely a benefit for you. I would leave that to your own playing style. A lot of the players aren’t really building into full archer units. The majority is going to be building cavalry and infantry units but you can be the difference. Why not? This is a really good buff. It is a really unique. It increases the skill damages for all nukers. If you’ve already heavily focused on the nuker commanders or the skill commanders, this is a great civilization for you to switch on. It’s really going to be boosting your capability and your efficiency in the battlefield! 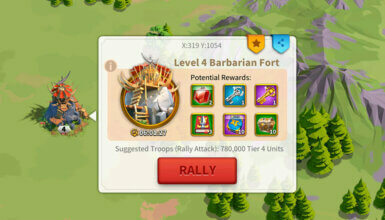 This is a super good buff if you are the rally person, if you really are the one that is going to be attacking governor cities, Barbarian Forts or any Alliance building. Damage increasing by 5% is really massive because you don’t really get that buff unless you have the Shrine buffs. This is another unique buff. It’s going to be really helpful throughout the game. It’s going to be hand in hand with the Rally 5% Buff above. Now if you attack a Barbarian Fort, you have that 5% rally buff and then having this 10% damage buff. That is a massive combination. This is going to be really great if you are building a full cavalry unit. The Arabia does have a cavalry special unit so Arabia could be a good option for you if you’re really building into the full cavalry and you want to be the rally person. This could be a really good pay-to-win nation because most P2W players are the ones who set up the rallies for Alliances. This is a good civilization for you if you I’ve already been playing the game for a while and you are in the later stages of the game. Similar to Byzantium, Korea has the Hospital Capacity increased by 15%. This is really good in the later stages of the game when you have a lot of expensive high-tier units and you really do not want them to die. This is quite beneficial in the later stages of the game when need to research for Tier 4 units. They are really really strong units in the later stage. And also you’re going to be researching tier 5 units as well. The amount of time to research them takes just too long (weeks to months) so this may be a good civilization to switch on during that period of time. I don’t really find this very useful. It really depends on your playing style so I would let you guys decide! 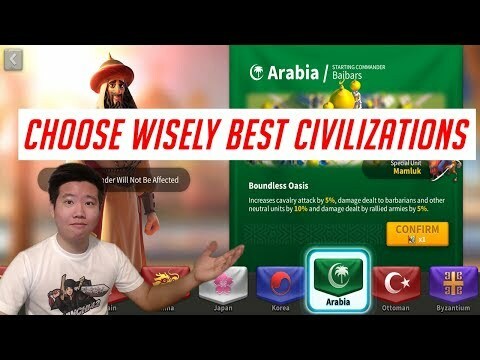 This civilization could be really beneficial for you in the later stages of the game but do choose wisely. You can always do a step change if you have the free scroll or you can buy one for 10,000 gems to switch. This is a super great buff because it’s going to help you a lot at the early game, when you want to try to unlock everything in the kingdom at the early stages, especially when you make a jumper account. But in late stage of the game, you can be just patient enough and wait you for the scouters. It pretty much depends on your playing style but the scout marking speed increased really benefits you in the early stage of the game. There is a monument for that when you unplug the whole kingdom, you’re gonna get some rewards on your monument so make sure to check that out if you are interested in getting the rewards. This is very nice because it’s going to increase your gathering speed on all types of resources. This is a very great buff as it’s going to increase not just one specific type of unit but all of the units in game. Japan is a really good Civilization for everyone to use at the early game. I am currently still using Japan. Really good buff in the early stages of the game and especially in the late stage of the game when upgrading high level buildings takes a ton of time. This allows you to farm Barbarians and Forts a lot more! It buffs your the recovery time, which is going to be beneficial a lot. You can have more action points. in that way it really helps you to farm and grind the Barbarians. You can get all those rewards quicker. This is also really good for some Barbarian and Neutral Units Farming Events so this is something that you may consider if you are really a grinder and you want to put a lot of time into Rise of Kingdoms. This is, again, a really good buff. This is something that you may want to consider if you want to be more of a defender for your City and your Alliance buildings, depending on your playing style. So do consider all these buffs here. I do like the combination of these buffs as it is really diverse. These all connects really help you grow your city in success! This civilization is really good especially for beginners! I don’t think this is a really benefit for you if you are starting off the game because at the beginning, you will really want to focus on building and rushing the your City Hall and get that Tier 3 + Tier 4 units right away. 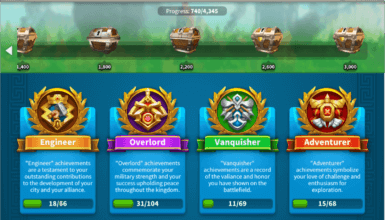 Only when you reach the later stages of the game, you want to develop all those resource buildings that you have and you can maximize this buff. So I don’t think this is a good buff for beginners. I do want to highlight this! In the early stages of the game, leveling up your commander is quite easy. Once you got into the a little bit later stage of the game, when you have your commanders are at higher levels, maybe about 40 or 50, leveling up your commanders can be more challenging and having this experience gained by 10% is really beneficial. If you can go and farm the Sanctum Guardians at this stage, with this buff that’s how you can really maximize your XP gained. This is depending on your grinding capability. If you really grind a lot and usually buy those action points in the shop, you can kind of negate this buff. This might not be the best buff for you at the beginning because you can just buy Living Legends and buy the Books of Knowledge and to negate this buff. It is going to be beneficial slightly in the later stages of the game. Again, this depends on your playing style. If you’re really building into the full cavalry unit then this is a good benefit for you or if you’re having a lot of cavalry units, this again this would be a great option for you. This is going to be really good in the later stage of the game when you’re trying to heal a lot of units after the hard battles. If you want to really be focusing on that healing speed, maybe this buff would be very beneficial through Alliance Battlegrounds because you want to be healing your units a lot faster. This may be a good civilization going into Alliance Battlegrounds. It really depends on your grinding capability. If you grind a lot, this can be negated. This is good! Having that HP buffs for all troop units is quite beneficial for you in the battlefield so do consider this. I think this Civilization is actually really good, especially that healing speed, this is going to be beneficial when you get into Alliance Playgrounds. This buff allows you to house more allies to get into your city, helping you defend your city against incoming attacks. This is good because you can really inflict a lot of damage to the attacker. If you don’t have a really good alliance or if you’re soloing in the game (which is also not recommended at all) this buff is not going to be beneficial for you. Or if you have a really good allies and they can just defend or camp around you, preventing any attack incoming, you don’t really need this buff. This is really good especially if you are in the later stage of the game, when you want train a lot of these T4-5 units. This is something that is going to be helping you a lot to establish more units! I don’t find this very useful. I find more useful to the buff that increases universal units so this is something that you guys have to decide on. If you are going to be building full Archer units which I don’t really see a lot in this game yet, but this could be something that is different that you guys can implement. As you guys have seen with China, the extra point cover is only 5%, I want to highlight that Germany has 10%, so this is going to be a better option for you if you are trying to grind into attacking Barbarians and Forts or any other events that involve action points. Now this is a grinding choice. If you decide to be a grinder, this may be a good good buff for you. Similar to Britain, 5% is the number there. It’s going to be beneficial for you in the later stages of the game as stated in the Britain section! Again, I’m not really care much about the specific type of units, which I care more is a universal buff. But if you are building a full cavalry units this is going to be beneficial for you. There’s a lot of playing styles. My playing style right now is kind of a mixed troops especially being a free-to-play or a baby whale a player. If you’re a whale player, Germany could be great for you! The pay-to-win players are going to be building into the full cavalry units because they can buy Minamoto right away and they can really train a lot of the Calvary units right away. So that you may want to consider this if you’re a pay to win player. This is going to be beneficial for those players that really want to move around the map really fast. A lot of the pay to win players also choose this civilization because they can buy Minamoto easily and then building a full Cavalry army. This is going to be beneficial for them and so that they can move around the map so much faster and they can defeat the enemies a lot quicker. Again I don’t really find them really that much useful. I think you can just negate this through a process of grinding and you’re gonna have a lot of good commanders that’s going to have some really decent gathering speed for food. Again, this depends on how your playing style. If you’re building into the full Calvary units, this would be great for you. I really prefer more of an universal buff because a lot of players are actually going to be building more of a mixed army than a specialized one so that’s something that you guys need to consider.